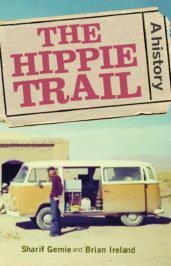 The Hippie Trail was one of the last, great expressions of the counterculture during the mid-1950s to late 1970s. Headed to the East, the most celebrated route was from London to Kathmandu, although many stopped in India or went on to Australasia, and there were subsidiary routes to the Mediterranean, to Morocco and to the Middle East. When the overland path was all but closed by the Soviet invasion of Afghanistan and the Iranian Revolution, travellers found other routes and other destinations. The Hippie Trail and the Hippie Movement remains the most iconic journey, and perhaps the most iconic happening, respectively. Perhaps influenced by Jack Kerouac’s 1957 novel On the Road, which celebrated travel as a way of life, by the end of the 1960s about one million young Americans had taken to the road in the United States, and another 800,000 were travelling in Europe. This era of cheap mass travel, together with the availability of transatlantic commercial flights and the strength of the US dollar, acted as a catalyst for tourist travel. However, some chose to travel to the East, beyond the parameters of Western culture and outside the usual supportive tourist infrastructure. Why was this? Any why was India so popular? The answer might be found in Kerouac’s insistence that life on the road was a route to enlightenment. In the years following World War Two, and especially in the 1960s, many Americans turned to the East for answers to, or escape from the turbulent, frightening and confusing Cold War world they now lived in. The Vietnam War loomed large in everyone’s minds. From 1941 to the 1975 the United States had gone to war with three different Asian nations. These wars helped keep south-east Asia in the foreground of American consciousness; and for many young people their first experience of South East Asia was as conscripts in the US military. Others, however, wanted to experience the East on less confrontational terms. [I]t was the modern-day equivalent of Thomas Jefferson’s assertion that the ‘pursuit of happiness’ was a foundational American aspiration. The notion of a more spiritual East proved attractive. Non-Western religions such as Buddhism and Hinduism thrived in post-World War Two United States because they offered alternatives to traditional American religious practices. In that era, many Americans lost faith in the powers of organized religion: until the 1960s, most Americans belonged to the seven main Protestant churches, and there were also thriving Jewish and Catholic communities. While the post-war ‘baby boom’ supplied a new generation of parishioners for these mainstream churches, it also provided a generation that questioned the tradition roles of organised religion and authority in general. It was Buddhism that proved most attractive to American hippie trailers. A number of key texts had raised its profile in the United States, such as Paul Carus’ The Gospel of Buddha (1894), Dwight Goddard’s Buddhist Bible (1932). However, in the 1950s it was the works of T.D. Suzuki, Jack Kerouac, Alan Watts and others in the Beat Movement that were most influential. In addition, Herman Hesse’s Siddhartha (1922), was published in the U.S. in 1951 and quickly became an easy intro to basic Buddhist themes. And Timothy Leary’s The Psychedelic Experience; A Manual Based on the Tibetan Book of the Dead (1964) suggested enlightenment could be found in Tibetan Buddhist writings. Until the 1960s, Buddhist communities in the United States comprised mainly of Chinese and Japanese immigrants, and were situated predominantly on the west coast and in the Hawaiian Islands. However, changes in American immigration laws in 1965 resulted in increased immigration from Asia. As a result of these changes, the number of Buddhists in the United States swelled considerably, and Buddhism reached California, New York, Texas and Illinois. But the Buddhism of the immigrant communities and the new Buddhism of the young Americans were very different. The most recognised voices of the new spiritual culture were overwhelmingly Euro-Americans, and they embraced dharma (going with the flow of nature and cosmic law to attain contentment) as if it was the modern-day equivalent of Thomas Jefferson’s assertion that the ‘pursuit of happiness’ was a foundational American aspiration. The International Society for Krishna Consciousness, known widely in the West as the Hare Krishna movement, was founded in New York in 1966. The first Buddhist centre was established in the United States in Vermont in 1970 and by 1987 there were 429 such centres. However, those seeking deeper contacts with Eastern religions often felt the need to travel to their spiritual homelands, and trip along the Hippie Trail served as a rite-of-passage pilgrimage to their spiritual goal. There was no shortage of colourful figures to attract them. For example, Sai Baba, a Hindu mystic, performed acts of materialisation and healing at his ashram. It probably helped that he resembled Jimi Hendrix with a bouffant Afro hairstyle. And Rishikesh, on the banks of the River Ganges, and a pilgrimage site for Buddhists, became widely known in the West after the Beatles’ visit there in February 1968 to study under Maharishi Mahesh Yogi. Many followed in their footsteps. Many travellers perhaps naively imagined the East as a cure for the ailments of the West, but there is no doubting the sincerity of their hopes. They really believed that a journey to the East could lead them to some form of enlightenment (and a few even found it). Almost all, though, speak of the profound effect the trail has had on their lives, and reflect on its enduring positive influence. Brian Ireland is a modern American historian. He has written about such diverse topics as the US military in Hawaii, commemoration and remembrance, travelogues and road movies, rock music, comic books, television, and science fiction literature. He is the co-author, with Sharif Gemie, of The Hippie Trail: A History.